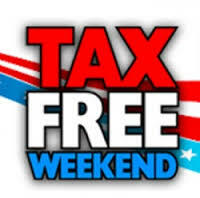 Virginia Tax Free Weekend 2018 Date, Items List, Limitations. School Supplies < $20. Purchases of certain school supplies, clothing and footwear are exempt from the Virginia sales tax. Each eligible school supply item must be priced at $20 or less, and each eligible article of clothing and footwear must be priced at $100 or less. Energy and Water Efficient Products < $2500. Purchases of products meeting the Energy Star and WaterSense qualifications, such as certain energy-efficient appliances, are exempt from the Virginia sales tax. Eligible products must be priced at $2,500 or less for each item, and be purchased for noncommercial home or personal use. Emergency Preparedness Items Breakdown:Purchases of items designated by the Department of Taxation as hurricane preparedness equipment are exempt from the Virginia sales tax. Portable generators priced at $1,000 or less, gas-powered chainsaws priced at $350 or less, chainsaw accessories priced at $60 or less, and other eligible items priced at $60 or less for each item are exempt from sales tax. Under Virginia law, most purchases of tangible personal property are subject to both state and local sales and use taxes. The tax rate is generally 5.3% (6% in certain jurisdictions) of the sales price. The tax rate on sales of food for home consumption is 2.5%.